It was an absolute honour – I really can’t believe it. 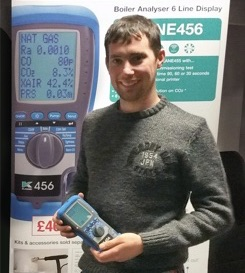 Having used different makes of analysers over the years Shaun has found Kane to be “the best of the bunch” citing ease of use, robustness and good value for money as the main reasons they use Kane analysers. The 2 day turnaround during annual calibration is brilliant and reduces our down time. As our company grows we continue to buy Kane, we now own 5 and as long as Kane maintain their customer service and quality we won’t be changing!